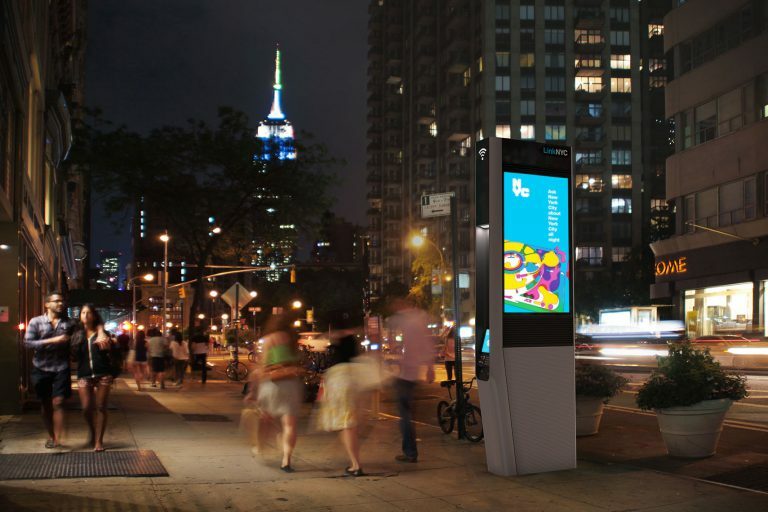 Last year, New York began rolling out LinkNYC kiosks, replacing defunct analog phone-booths with 9.5-foot-tall, digital monoliths. The goal, according to LinkNYC’s website, is to make free, high-speed wi-fi available to all New Yorkers by deploying 7,500 kiosks across the city over the next eight years. Critics, however, warn that the launch of LinkNYC does more to empower the surveillance state than the average New Yorker, who will be at risk of having their privacy violated every time they walk near one of the stations with a smartphone in hand. “Basically, Links is corporate-owned, not community-owned,” said Adsila Amani of Rethink Link NYC, a pro-privacy group which held the first public protest against the creepy kiosks in January. LinkNYC and public wi-fi in general track the IP address and cookie IDs of every connected device. While there are legal statutes protecting this so-called anonymized data, companies, governments and hackers alike have developed and utilized various de-anonymization methods to link individuals to their personal data. LinkNYC is a public-private partnership between the City of New York and CityBridge — a consortium of private companies that includes Sidewalk Labs, a subsidiary of Google run by Dan Doctoroff, a former deputy mayor in the Bloomberg administration. Under the 12-year franchise agreement City Bridge signed with the de Blasio administration, LinkNYC anticipates generating hundreds of millions of dollars in ad revenues that will be split equally with the city. The agreement also stipulates that CityBridge will not share “personally identifiable information” with governmental authorities except under subpoena, in which case the company will make “reasonable attempts” to inform users when their information is accessed by the authorities. This is not enough for privacy advocates who insist the deal sells off valuable public space — both physical and digital — to a corporate consortium whose business model is based exclusively on data collection. Attorneys with the New York Civil Liberties Union penned an open letter to the de Blasio administration in March. They raised concerns over CityBridge’s indeterminate data collection and retention policy, government access to user information and whether users will receive timely notice if their information is shared with authorities. “We applaud and support the city’s goal of making the Internet more accessible to all New Yorkers, but this effort should not result in creating a class of residents who otherwise cannot afford the Internet and must pay for their access with their right to privacy,” reads the letter. LinkNYC’s big brother capabilities extend beyond carrying out personal data collection on a massive scale. Each of the 7,500 kiosks will be equipped with three cameras — each pointed in a different direction — for a total of 22,500 cameras. The NYPD currently has access to 6,000 street cameras, two-thirds of which are privately owned, as well as 7,000 more surveillance cameras installed in public housing and another 4,000 inside subway stations. Alexander Urbelis, an information security consultant and partner at Blackstone Law Group, says it is inconceivable that the data collected by LinkNYC kiosks will remain private. As LinkNYC spreads outward from the center of Manhattan, the likelihood that it will be misused in predominantly people of color neighborhoods that have a history of being over-policed also grows. “Surveillance has never been colorblind,” noted Jonah Bossewitch of Rethink Link.